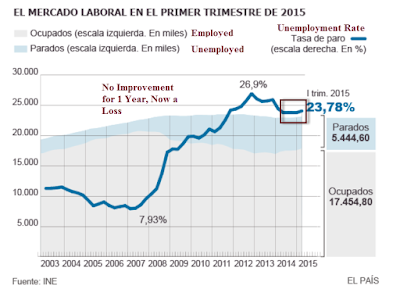 Via translation from El Pais, Spain's Unemployment Rate Rose Slightly in the First Quarter. The economic recovery has not been enough to create jobs. In the first three months of the year, the economy shed 114,300 jobs. The result has been a slight increase in the unemployment rate from 23.7% to 23.78% according to the Labour Force Survey (EPA) published by the National Employment Institute. The rise in unemployment could have been higher if not for the significant decline in the labor force. This group has fallen by 127,400 people to 22.9 million. As was the case in the previous quarter, again, the labor kick is a decline in private employment (143,500), since the public has grown to 29,200 jobs. Those are horrific numbers. The unemployment rate would be higher except for a decline in the labor force coupled with public sector hiring (likely an election ploy given national elections this Autumn). The only way Spain can grow and hit budget deficit targets is via numbers like these. In fact, I strongly suspect Spain will miss its budget deficit target because of public sector spending. How long before Spanish citizens have had enough? The next national election may be telling.